Boehm-Madisen Lumber Company is a third generation forest products company with a long-term vested interest in responsible forestry. We source forest products from a very diverse group. The vast majority of these companies ascribe to one or more certification programs including Forest Stewardship Council® (FSC®), Sustainable Forest Initiative (SFI), American Tree Farmer and Programme for the Endorsement of Forest Certification (PEFC). Regarding imported forest products, we abide by the principles of the Convention on International Trade & Endangered Species (CITES) and the Lacey Act which protects against illegal logging. Some imported species are also FSC® certified. 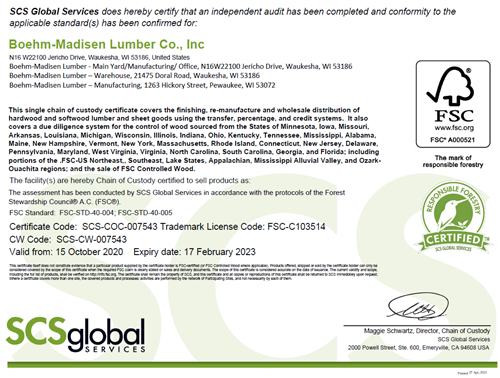 In addition to our environmental commitment, Boehm-Madisen is FSC® Certified. FSC® products are very unique. The “chain of custody” (COC) certification process allows products to be segregated and identified as having come from a FSC® certified forest. Boehm-Madisen is chain of custody (COC) certified to offer mixed, pure, recycled and controlled hardwood, softwood, millwork, sheet stock, milled and/or laminated products. View certificate. The FSC® program is a certified wood system accepted by LEED for New Construction Credit. FSC® information and standards can be found on the Forest Stewardship Council® website.